When it comes to conducting a serious search for a home you need to find out how much you can borrow to cover the purchase price and closing costs. Lenders generally offer two processes for answering this question: pre-qualification and pre-approval. The Pre-qualification Process gives you an estimate of the amount you can borrow. This process helps you establish a price range. Most real estate professionals require pre-qualification. You can go to a mortgage broker or bank to pre-qualify for a mortgage loan. You can also pre-qualify by telephone or online. The application involves a review of your credit history. You will need to provide your Social Security number, employment history, current income and expenses, current bank balances and addresses for the previous three years. Pre-qualification simply states that you qualify for a loan based on some preliminary questions, but it does not commit the lender to approve the mortgage. Pre-approval is more thorough, with the lender reviewing your credit history, earnings information, employment history and assets. Pre-approval determines the actual size of the mortgage for which you qualify. This guarantee strengthens your position to make an offer on a house. The pre-approval process sometimes takes as long as 60 days and requires you to submit extensive financial records, because you are actually applying for a loan. Some lenders charge fees for a pre-approval, and they may not be refundable. 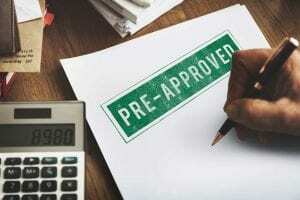 Unlike a pre-qualification, a pre-approval binds you to a specific lender. To improve your pre-qualification and pre-approval prospects, request a credit report from www.annualcreditreport.com, and verify that all of the information is accurate. You will also want to show a lender that you have some cash reserves (3-6 months living experiences) to handle financial emergencies that could occur after purchasing the property (job loss, major repairs, or medical problems). Just because you qualify for a $1,500 per month mortgage payment does not necessarily mean you should spend that much. Homeownership involves many related expenses including utilities, insurance and maintenance. If you can comfortably afford your payments, you will be better equipped to handle surprises – from needing a new roof to an increase in property taxes – that are bound to pop up along the way.